*The creams can be made a day in advance and kept refrigerated. In a small heatproof bowl, sprinkle the gelatin over the cold water and allow the gelatin to soften for 10 minutes. In a medium heatproof bowl, whisk together the half and half, sugar, sour cream, and crème fraîche. Place the bowl over a pan of simmering water; making sure the bottom of the bowl does not touch the hot water. Heat the cream mixture until it is warm, stirring occasionally. Remove from the heat. Heat the bowl of gelatin in the microwave until the gelatin is dissolved and no longer cloudy, about 15-20 seconds. Whisk the gelatin into the cream mixture. Stir in the lemon juice and vanilla. Strain the mixture through a fine-mesh sieve into another bowl. Divide the mixture evenly into six 5-ounce ramekins or dishes. Refrigerate until set, about 4 hours. 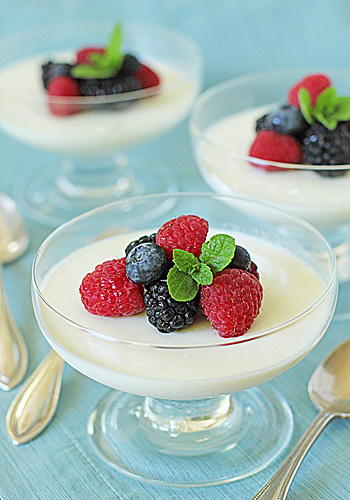 Serve chilled topped with the berries and sauce. For an alternate presentation, dip the base of each ramekin into hot water for several seconds, then run a thin paring knife around the inside edge of the ramekin and invert the cream onto a serving plate. Top with the berries and sauce and serve. Enjoy! In a blender, purée the raspberries with the sugar, lemon juice, and framboise. Set a fine-mesh sieve over a bowl and strain the raspberry mixture, pressing firmly with a rubber spatula. Serve chilled or at room temperature. Stored in the refrigerator, the sauce can be made up to 3 days in advance. This dessert is right up my alley!! I think I love everything about it. Raspberries are just coming into season at my local farmer's market and I have them on my list for this weeks visit, I think I just might have to buy extra! I miss soccer!! My son is 14 now and has stopped playing, but I had so many enjoyable weekends cheering the different teams on! Enjoy while you can. These are so pretty and such a lovely name. I posted a recipe for a blueberry curd which would also be very delicious with this dessert. Love you photos! I don't which I love more, your recipes or your photos! Lovely dessert; will you be my mom?